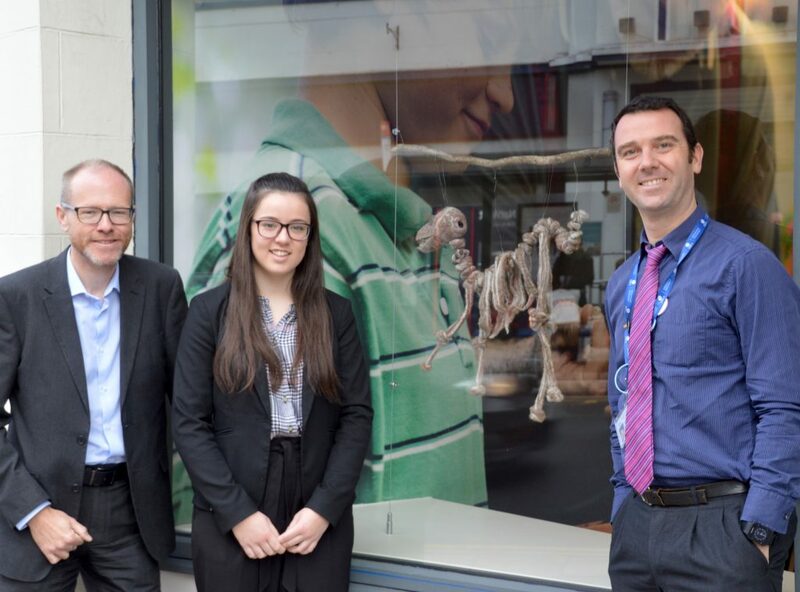 A textile dinosaur created by a Rugby High School for Girls pupil who won the top prize in a Rugby Festival of Culture exhibition is on display in the window of the North Street branch of Hinckley & Rugby. The Society sponsored the Festival’s summer Aiming High exhibition and later invited 16-year-old Katie Woodcock to loan Terry the T-Rex to its Rugby branch until Christmas. (L-r) Marketing & PR Manager Stewart Heeley, winning student Katie Woodcock and Rugby High School deputy head Mark Grady meet Terry the T-Rex! Katie created the felt dinosaur for her GCSE textiles course and it helped her achieve a highest possible grade 9 and was then the star of the show for talented young artists in the Floor One Gallery at Rugby Art Gallery and Museum. “Terry is a wonderful creation and we are very pleased to be providing a showcase for Katie’s innovative and talented work in our North Street branch. “My project’s theme was ‘mystery and imagination’ so I initially decided to look into bones. My textiles teacher and I then decided to develop that into dinosaurs. I made it by wet felting wool and shaping and moulding the individual pieces and stitching them together. “I’d like to offer huge congratulations to Katie for her winning entry to the Aiming High exhibition, which again showcased the number of talented young artists we have in the borough.